- Maybe use polycarbonate rather than perspex. - For the cable gland, try epoxying a brass tube into the polycarbonate. Then slide the cable through this gland. Then slide a piece of silicone tubing over the cable and the brass tube. I will post more constructional details over in the "How to" section. I enclose the board details and parts list for my modification of the Loughboroough Hydrophone. Pinger details showing the use of the handy B & Q stop end as an enclosure. The Pinger should be placed in a free flood part of your submarine where it will provide a sound source for about a month. Glue a PVC disk to form one end cap of the enclosure. Use a piece of card (the red thing in the photo) to switch the unit off. A crude little thing that provides a lot of piece of mind! Perhaps the philosophy of sealing is - "better to break seals only very occasionally!" Actually I've gone back to using these very useful B & Q caps. They are good. I've now also taken the precaution of epoxying a short length of brass tubing into the enclosure. This is so that I can pressure test it using my normal (orange!) inflated balloon method which I do on all my subs. Cheap and Simple Hydrophone Preamplifier/Amplifier for Headphones. By David Forrest and Brian Alps. 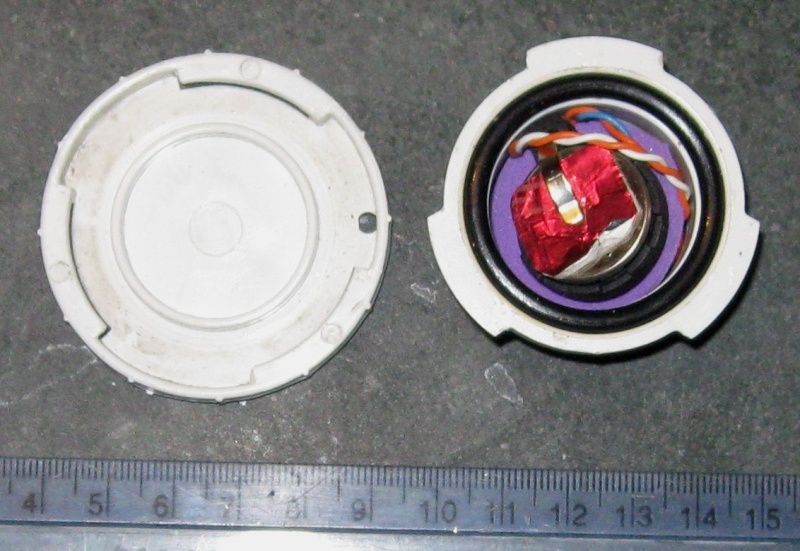 This summer I have been having a look at making hydrophones more easily and cheaply available. They are very useful things for our hobby. They can pick up motor, pump and even servo noises at ranges of 10’s of feet and with a Pinger, on the sub (Pinger chip available for £5 to AMS members.) you are very unlikely to lose the submarines in even the darkest, dirtiest water. The more hydrophones there are at the pond side, the better for all of us – hence this article. You need a hydrophone together with a preamplifier/amplifier. The Loughborough University “Bender” hydrophone is an excellent design. Cheap to make and very simple for the typical model submariner to build. We know about Perspex sheets, bolts, O rings etc. The preamplifier and amplifier using the Loughborough University design (and my mods to it) are very effective but quite complicated to build. You need to make your own printed circuit boards etc. So I had a look at what was commercially available and my suggestion would be to use the excellent kits produced by Velleman - available from Maplins. They cost about £6 each and contain a good quality circuit board, components and instructions. Most people who have a soldering iron could make these kits (or someone could make them for you.) and they only take a few minutes to build and can be tested individually. Mount them in a metal box. (I used a tin box and the shortcakes were delicious – see photos) for screening. I added an on/off toggle switch (with a guard to prevent it being knocked on ) and an LED to show power on. Plug in the Bender Hydrophone which “you made earlier” and you are away. I’ve tried using it in comparison with the original design. 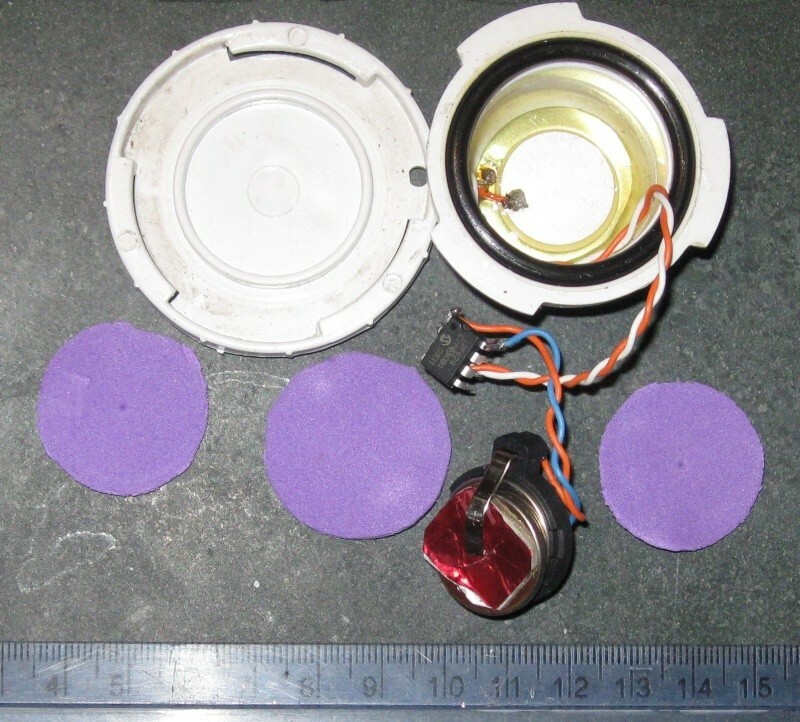 This is more sensitive because it contains passive filters, but the cheap and simple design works well and should form part of your pond side kit. It should not be too difficult to add some passive filter stages to the Velleman preamp board. Perhaps more information later. German 'Kemo' Universal Preamplifier Module M040, Order Code: N69AW @ £6.99, operating voltage 9-24 vdc, input voltage 2-50 mV, output voltage 200 mV, current consumption 2 mA, dimensions 30 x 25 x 15 mm. German 'Kemo' Universal Amplifier Module M031N, Order Code: N64AW @ £6.99, operating voltage 4.5-12 vdc,output max 3.5 W music power, loudspeaker connection 4-16 ohms, input sensitivity >80 mV, frequency response 40-20,000 Hz, dimensions 40 x 40 x 12 mm. A 10 k ohms log. pot. should be connected between signal source and the amplifier module. Preamplifier connected between the source and the pot. I installed a DC charging socket for a 9.6 NiCad battery which I used to use in my Tx. Hydrophone design according to your instructions (So basically the Loughborough model, David’s comment. ), except I used thick plastic card for the discs. I have been doing some more Pinger trials in the Barrow pond in the last few weeks. This Pinger still contains the reed switch and the 2x CR2032 batteries which give about a month's life. I don't think I would recommend building the Loughborough preamp/amplifier design nowadays. It is rather too complicated for our purposes. I see that the K8066 Velleman 3W Mono amplifier is no longer available but any audio amplifier kit or module should be OK here. Just to say that I have tested at Barrow an alternative to the audio amp which is no longer available. This is the MAP439 1 Watt audio amplifier kit available from Maplin or www.mutr.co.uk. Is the most simple and cheap I've found and it seems to work great!. I tray-ed 100 times to get into those link you've posted but NOT working !!!. That simple amplifier looks very promising. Simple but has a preamp stage. Let us know how well it works. Let me know if this link does not work. - I didn't find all the components yet but I wheel keep you on post it. - what PIC can replace yours 08M2 (in my country NOBODY bring these PIC! ).....the 16F84A is working?,or what other Microcontroler can be used?.....can You send the code for programing by eMail?....what is actualy the sound produce by Your device?. The simple piezo element will work well. The design you showed me is for an electret microphone. It should work with a piezo input. (I think a resistor could be removed that provides a voltage to the electret.) But try the original circuit first. I can probably send you a recording of a PIC signal if you would like? I understand the complexity of the problem. Only yesterday I succeeded to find all the components for the device.Maybe next week I can find some spare time to do it. - b)the Hydrophone - witch form Your experience - all of as should have it at home!. PLEASE if You can send me the sound by email. I'll send You by PM my mail address. I will send the Pinger sounds recorded at Barrow to Richard to see if he can upload them here. - what should be the maximum length of the cable? That's wheel be all for know!. I don't think a Loughborough University "bender" hydrophone is very fussy as far as materials are concerned. It works like a drum and so will have a resonant frequency but what you have described will probably be OK.
Coaxial is better to eliminate main hum etc. but there is not much mains hum by the side of a pond! Twisted cables may be well be OK. The news items about the loss of the MH 370 airliner prompts me to remind model submariners about are very own Pinger beacon, to locate lost subs. Lots of information on the Forum and you can still buy the AMS Pinger chip for £6. I don't seem to hear the cheery Pinger "chirp" very much on other peoples subs nowadays so they are risking just going home with their transmitter. Unless they are lucky enough to only operate in gin-clear water which must limit their hobby rather. As the experts say it is not IF you lose your sub but WHEN! Just a gentle reminder warning for the start of the season. Pinger receiver by simply removing the playback head and soldering in the transducer head cable. Its nice and compact but have you any thoughts as to its electrical suitability?